We are located in beautiful Lake Wales and Orlando Florida and Jasper Alabama. We do foot launch and trike training depending on your needs. We are offering free lodging for spring 2018 to all students in the Jasper Alabama training facility. Training fee is non refundable! TAKING YOU OFF THE SIDELINES AND INTO THE GAME! Attention: WE DO NOT OFFER ANY IN HOUSE EQUIPMENT FOR TRAINING. WE DO SELL EQUIPMENT FOR STUDENTS TO TRAIN WITH. 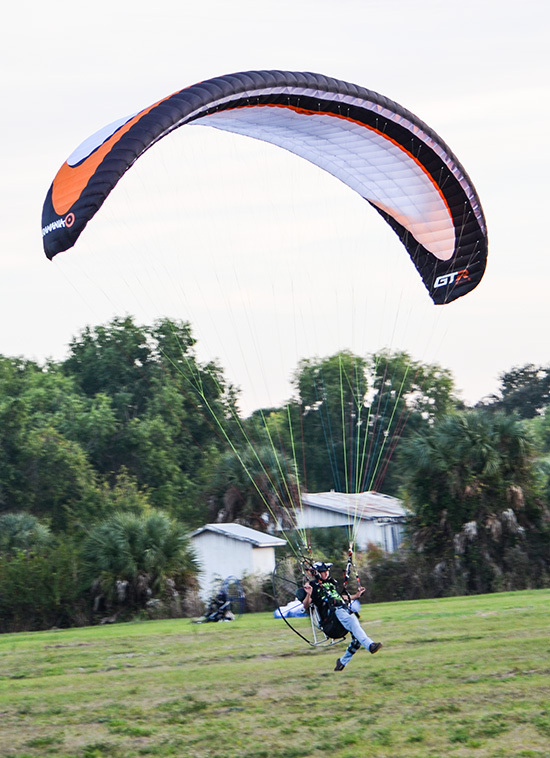 UFO PARAMOTORS is offering each new student a 1 year membership to the USPPA to earn your ratings. Over the last decade, the sport has grown dramatically. With this growth, industry leaders started to notice a trend in sub-par training resulting in more personal injuries. 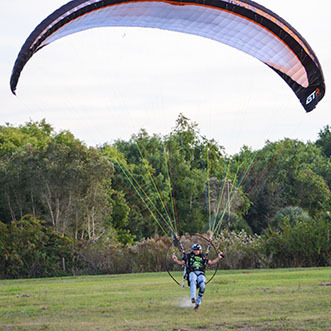 Several industry leaders and Instructors got together to create an organization called the United States Powered Paragliding Association or USPPA. This is a non-profit organization, run by volunteers. Their goal was to create a unified and standardized training syllabus, ensuring that all pilots are provided the sufficient knowledge needed to fly safely. In addition to their thorough training outline, the USPPA created a 3-level pilot rating system, challenging pilots to continue their education past the initial training. These are known as PPG1, PPG2, and PPG3 ratings. Each rating requires that the pilot demonstrates specific skill sets. There are also written tests which must be passed and signed off by a USPPA Certified Instructor. WATCH OUT for potential Instructors who discount the USPPA or its rating systems. These are usually individuals who have been kicked out of the organization due to poor conduct or endangering others. 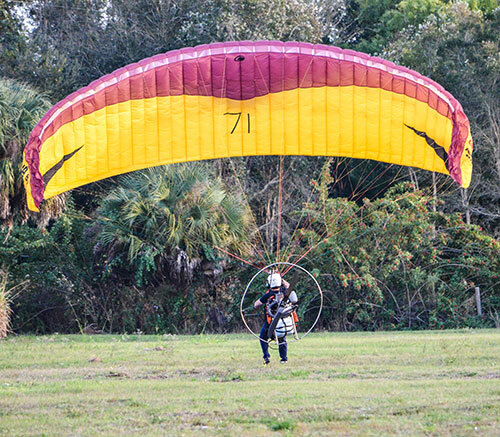 Sign up for a membership and UFO PARAMOTORS will deduct the from your training fee. Become a member of the USPPA here. Below is a brief breakdown of how the training works, what you might need on the day, and pricing. You’ll walk away from our course knowing how to make life saving decisions on whether or not to fly on a particular day, where to fly safely, and how to take care of your equipment so that you can feel confident every time you fly. We want you to have a long and rewarding Powered Paragliding career, and will train you to ensure you get the most out of one of the most incredible things you will ever do. We only charge $2500 as a early spring special we are charging $2,000.00 to get you confidently flying and having fun. And, you will always be a student at UFO paramotors until our instructors feel confident enough for you to spread your wings and fly on your own! Ready to stop watching from the sidelines and be a part of the action? New students learn at a different rate, some will solo sooner than others, we will make sure that the necessary time will be taken to insure that you are trained safely and correctly. The PPG Full Foot Launch training lasts 8 to 10 days, weather and student skills permitting. The PPG Trike Launch training lasts 8 to 10 days, weather and student skills permitting. (ADJUST FOR TRIKE). 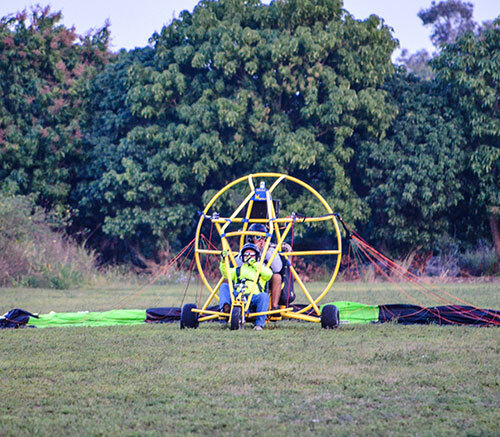 During the first 2-3 days, the student will learn terminology and maintenance of their equipment, basic meteorology (weather to fly), aviation regulations, inflation techniques (forward and reverse) with and without the paramotor, ground school on flight patterns and landing procedures. Once a student has mastered these techniques and has a clear understanding of the flight procedures, the student’s first solo flight on the 4th or 5th day will take place. Then the fun really begins! *OUR TRAINING INCLUDES A GOPRO VIDEO OF YOUR FIRST FLIGHT! CAPTURING ONE OF THE MOST INCREDIBLE MOMENTS OF YOUR LIFE…FOR FREE! A small price to pay for what could be the most amazing thing you ever do! TRY OUR INTRODUCTION TO POWERED PARAGLIDING. For just $100 you can get a taste of what this sport is all about. This lesson is an introduction to the incredible sport of Powered Paragliding. It is offered when an instructor is teaching other students at the training site. Students will get a chance to see, touch and try on all the equipment, and you will learn some basics of ground handling a paraglider with a harness. Depending on conditions, the instructor can demonstrate smooth take-off and landing techniques, smooth and hard turns, low flight maneuvering, touch and goes, minor wing collapses (Big Ears), and a power off landing during the flight. *The cost of your Introductory Hands-on lesson will be taken off of your full training if you decide to become a PPG pilot. STILL NOT SURE? CONTACT US HERE AND WE’LL ANSWER ALL YOUR QUESTIONS. Please fill in the Captcha code to fool the bots! The best times to fly are 2 hours around sunrise or sunset since the air tends to be smoother and calmer during these times. The weather will also be a factor so make sure you leave plenty of time for the unexpected. During training Please bring lots of water (at least 1/2 gallon per person), sun protection (hats, sun block), and some high energy snacks like cliff bars and fruit. Dress comfortably according to the weather. You may want to bring a light windbreaker. Sunglasses are optional. We will provide helmets for training protection. We require all participants to sign a Release, Waiver, and Assumption of Risk Agreement. If you’d like, bring a friend to watch and take pictures, and get lots of rest the night before, the first day can be very tiring. We look forward to working with you as you learn how to fly! Please feel free to call or email with any questions. “Training fee is non refundable”!! 1. Royal Plaza Inside Disney World – Normal rate is $102 a night, but they are offering a rate of $67 a night if you stay with in July. Please call one of our friendly reservationist at 1-800-651-1005. 2. Best Western Inside Disney World – Normal rate is $135 a night, but they are offering a $82 rate if you stay with us for the month of July. Don’t forget to ask about a Disney view room, for just a few more dollars a night ($12) we can guarantee you a room which over looks EPCOT. 3. Holiday Inn Resort Lake Buena Vista– If you are desiring a hotel near Disney World at a great price and value then you need to check out the Holiday Inn Resort. We are offering this resort for $85 a night during the first the entire month of July. If you have a larger family, this hotel has the kidsuites which sleep 6 people for $119 a night. Here at Orlandovacationhotels.com They have a full staff of Orlando travel specialists waiting to assist you. Please note, we will need at least 24 hours prior to your arrival to make a reservation and at least 72 hours to make a reservation at a Disney condo or Disney vacation home.